Welcome to Halifax! For the fashion forward shopper, the city has a fabulous shopping district that includes a variety of smaller boutiques, as well as a shopping center located right on Spring Garden Road. If you’re a bargain hunter, be sure to hit up the second hand clothing stores that carry trendy vintage pieces at affordable prices. On a bright and warm summers day, Carly met a friend for lunch at the Bicycle Thief patio. She wore a light, tank dress from Dynamite and paired it with a floral shaw. This simple and sophisticated ensemble was made to look effortless by leaving her natural curls down and relaxed. Carly is a dedicated and hardworking university student, but that doesn’t mean she’s too busy to take time out of her busy schedule to enjoy the local attractions the city has to offer! She wore this cool outfit to meet friends at the Halifax Jazz Festival, and does she ever look trendy with her fabulous topknot! The versatility of this outfit allows her to go straight to the bars on Argyle Street without needing to run home to change first. When Carly and her beau want to enjoy a quiet and romantic evening, they have a variety of options! Whether they want to enjoy a casual dinner at a local pub, or a fancier dinner at an upscale restaurant, Halifax has you covered! She chose to wear this flattering floral dress from MinkPink to dinner in Bishop’s Landing. 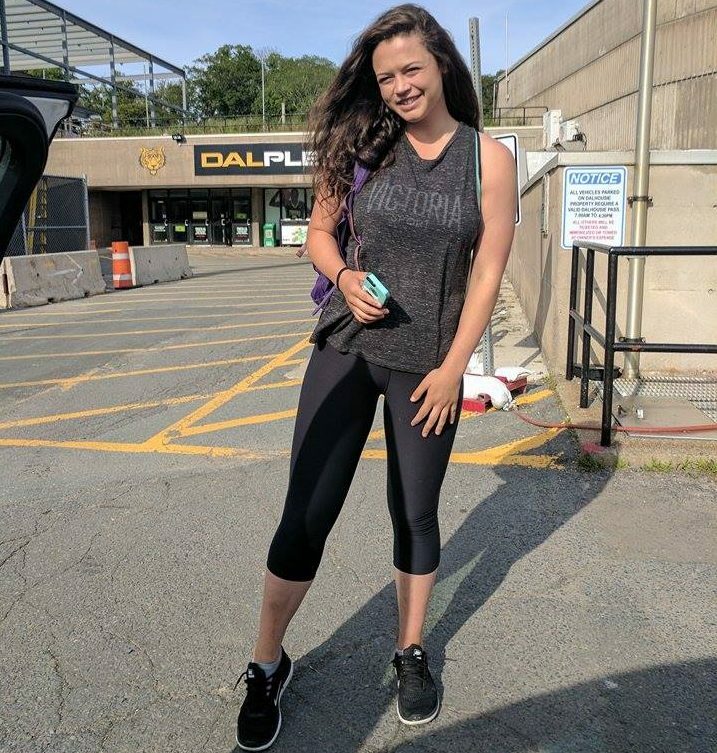 Carly also leads a very active lifestyle and can be found at the gym when she isn’t at school, working or with friends. Her favorite line of clothing to wear to the gym is Victoria’s Secret, they offer comfortable clothing with lots of support to ensure a successful workout. Halifax Seaport Market is the busiest on Sunday mornings, which makes Carly’s outfit perfect for browsing the goods offered by the local vendors. Her high-waisted maxi skirt was paired with a simple tank and loafers to pull this outfit together. She is able to comfortably enjoy a coffee and walk on the waterfront, and she has her cool shades to help keep the sun out of her eyes. Living in the heart of Halifax has allowed Carly to experience everything that this beautiful city has to offer. Her ability to mix and match patterns and colors highlights this seasons trendiest looks and really shows off her fun and bright personality.